Travelogue of An Armchair Traveller: Metal Monster or Metal Art? Metal Monster or Metal Art? Here is a huge metal monster on a pedestrian bridge in Kannenstieg, a new township just north of the city of Magdeburg, Germany. 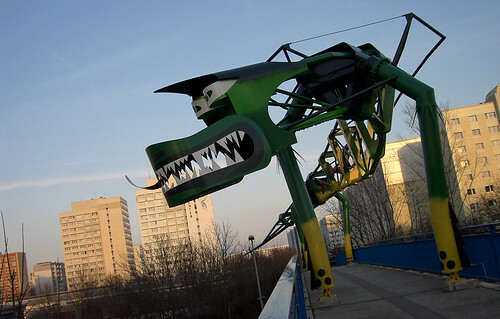 It depicts the mythical creature (Wyvern) and is 35m long, 8m high. I have not been able to find any further information about purpose, designer, year of construction etc. of this piece of metal art. May be readers of this post can come out with more info. The sculpture was designed by artist Astrid Barlebener Weinhold and was inaugurated in December 2005 to mark the celebration of 1200 years of town of Magdeburg. 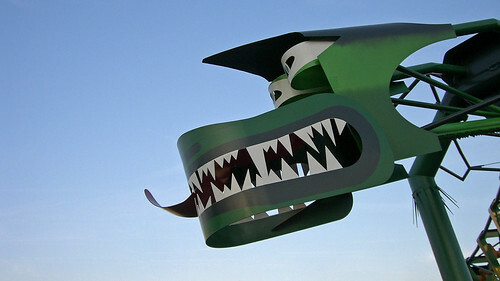 The sculpture is reportedly Europe's largest dragon sculpture. The area especially the nearby district of Rothensee has a legend about the dragon being killed by a brave warrior to save the beautiful daughter of the Count. Credits: I am thankful to Barnstormer, Master Guide, Google Earth Community (GEC) who found the above German web page. (Link to his post in GEC).